With mounting excitement and even a sense of urgency surrounding Tuesday’s vote, it would be easy to forget that it’s a midterm election. Until this year, the nation had a pretty ho-hum attitude when it came to midterms. In the last one — that was 2014 — turnout was particularly anemic. Only about 42 percent of those eligible cast a ballot nationally, according to data from the Current Population Survey (CPS), which is conducted by the Census Bureau. While that was the worst turnout in decades, no midterm election has broken the 50 percent mark nationally since 1982. Forgive me for indulging in a bit of local boosterism, but when it comes to exercising our civic duty, folks around here deserve a pat on the back. I looked at the CPS midterm election data for the 50 largest metro areas going back three cycles — 2014, 2010, and 2006 — and Seattle has been consistently near the top of the pack, with an average turnout of almost 56 percent. That ranks fourth highest, and it places us among just five metro areas where the majority of eligible voters cast a ballot in each of the last three midterms. The U.S. average turnout for those three elections was 45 percent. Portland gets a pat on the back too. Voters there have done even a bit better, ranking No. 2, behind Minneapolis. The Twin Cities area not only has the highest average midterm turnout. It also had the single best turnout. That was in 2006, when 66 percent of those eligible voted — that’s almost like a presidential election. A number of the metro areas had a particularly good turnout for just one of the past three midterms — maybe that was driven by a high-profile senate or governor’s race. But the Seattle metro, including King, Pierce and Snohomish counties, has been consistent. Even in 2014, with its dismal turnout nationally, 54 percent here cast ballots. The metro areas with the lowest average midterm turnout around are all in the southern half of the nation, with two located in Texas: Dallas and San Antonio. That isn’t too surprising, because Texas, in general, has the lowest voter turnout among the 50 states. 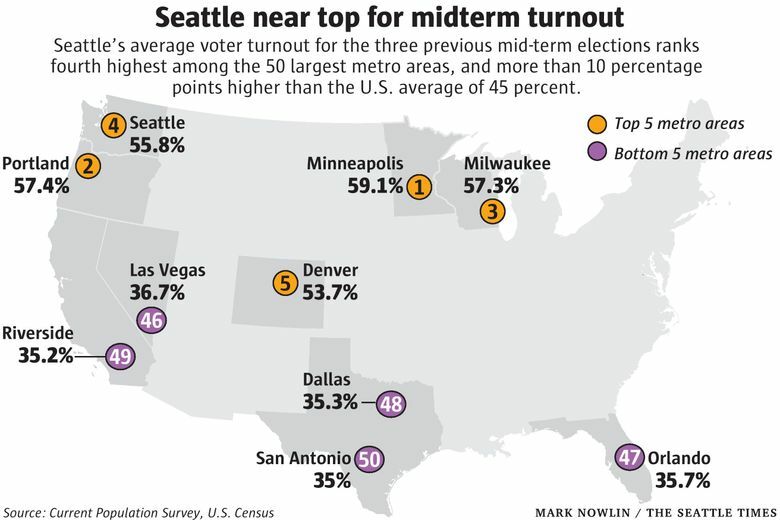 Why is midterm turnout high in Seattle and some other metro areas? A Census Bureau report explored data from previous midterm elections, and found demographics played a key role in determining the likelihood of voting. Age is a huge factor — 59 percent of seniors voted in the 2014 midterm, compared with 23 percent of millennials. Race and ethnicity were strong determinants, with white and black Americans significantly more likely to vote than Asian or Latino Americans. A higher level of education and income also corresponded to a higher rate of voting. To be sure, for many lower-income people, it can be difficult to take time off from work to go vote, and it means not getting paid for that time. That’s not an issue in states that use mail-in ballots, like Washington. On the other hand, gender is a relatively minor factor, with women just a little more likely to vote than men. Geographic region doesn’t have much of an impact, either, though turnout in the Midwest was a little better than in the rest of the country. In Seattle and the four other metro areas with the highest midterm turnout, income and education attainment tend to be well above average (Milwaukee is something of an exception in terms of income). In all five metro areas, the combined white and black population represents at least 70 percent of the total, which is not true of any of the metros at the other end of the spectrum in term of midterm turnout. When people don’t vote in the midterms, what’s their excuse? But 2018 is a very different midterm, and it’s hard to imagine many folks feeling that way this time.